Attention Buckeye readers: You can join Axios’ Mike Allen tomorrow morning at The King Arts Complex in Columbus, Ohio, for a breakfast conversation on the future of work. He’ll be interviewing: Jamie Dimon, JPMorgan Chase & Co. CEO; Josh Silverman, Etsy CEO; Francis Davidson, Sonder CEO; and Columbus’ own Jeni Britton Bauer, of Jeni’s Splendid Ice Creams. RSVP here. Hoping to change that, Microsoft used a San Francisco event Tuesday to show off some of the companies that are using the technology effectively. 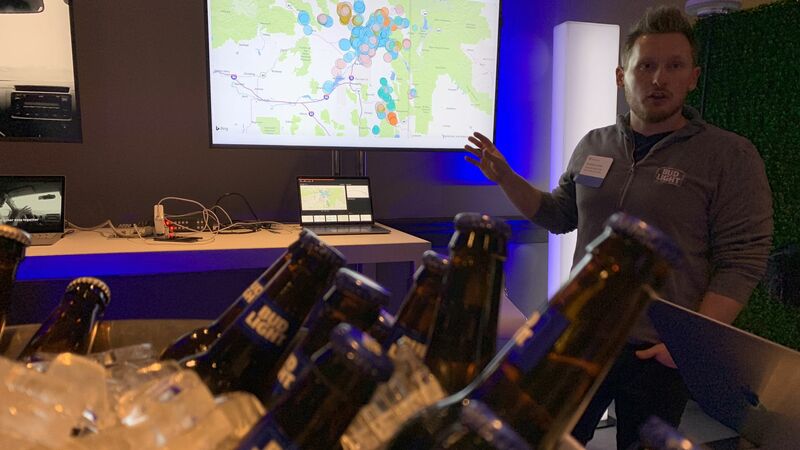 InBev, for example, has a platform called SmartBarley that gathers data from 8,000 of the company's suppliers to help them improve yields and lower their environmental impact. The growers agree to share their data with InBev, which in turn shares back the AI-derived insights with the farmers. "We are not a digital company. We are a company that is being digitized," AB InBev's Tassilo Festetics says. Startup Arccos Golf, only a few feet away, showed how it's using AI to create a virtual caddie for golfers, able to assess a player's stroke, weather, and other conditions. The startup says the early results are promising, with customers shaving an average of nearly 4 strokes off their game. The problem, though, is that most still don't know what it takes to get started, White adds. Both Microsoft and the customers on stage Tuesday agreed that it mostly boils down to data. If you want to use AI in your business, you need lots of data and it has to be in a common format. Flashback: MIT-Boston Consulting Group released a survey a year ago that also said American business executives expect AI to have a large impact on their companies but few were actually adopting the needed technologies. With Amazon making its HQ2 choices official, everyone is now weighing in on how the decision will impact everything from tax revenue to public transit and the political fallout. Details: Amazon is splitting HQ2 (and the 50,000 jobs that come with it) between two regions: New York's Long Island City and Arlington, Virginia. "Northern Virginia property owners are delighted Amazon HQ2 is moving in. Renters, first-time buyers and low-income residents aren’t." "New York is going to pay on average $48,000 for each of 25,000 jobs Amazon will create. It’s a $1.5 billion direct subsidy of the company. (I wonder what they think they’ll get back in taxes, over what period.)" "Amazon is a billion-dollar company. The idea that it will receive hundreds of millions of dollars in tax breaks at a time when our subway is crumbling and our communities need MORE investment, not less, is extremely concerning to residents here." "Excited to see how New York’s very well funded, often empty, and totally fine subway system will support Amazon’s new LIC office!" The bottom line: Even split across two cities, HQ2 will bring a substantial number of jobs and other benefits. It will bring headaches, too. Salesforce founder Marc Benioff lashed out at Facebook in a new interview with MSNBC, doubling down on his contention that the social network is akin to a digital-style tobacco company. "Facebook is the new cigarettes," he tells Kara Swisher during a half-hour MSNBC special that will air Sunday at 10pm ET. "You know, it's addictive. It's not good for you. ... The government needs to step in." Swisher challenged him on the contention, which he has made before. This time, though, an epic exchange ensued. Swisher: That's a strong comparison, cigarettes. Benioff: Well, I think it's the right comparison. Benioff: Well, I think this is — the right comparison that we can see that, you know, Facebook can have very serious effects on society the same way that cigarettes can. Plus: Benioff also spoke with Swisher about his purchase of Time magazine and his fight with other tech CEOs over San Francisco's recently passed Prop C initiative to help combat homelessness. You can see a video clip here. The Federal Communications Commission will launch the first of two major spectrum auctions today as the wireless industry tries to get the bandwidth it needs to deliver 5G. Why it matters: The regulator is under pressure from the big wireless carriers to make 5G a reality, Axios' David McCabe reports. The details: On Wednesday morning, the FCC will start taking bids for spectrum in the 28 GHz band. After the conclusion of that auction — senior officials didn't have a date when speaking with reporters on Tuesday — a second one will commence, with spectrum in the 24 GHz band. Both contain high-frequency bandwidth that carriers are hoping they can use to build out 5G networks. By the numbers: There are 40 bidders qualified for the first auction, which required an upfront payment, and 58 completed applications for the second, per officials. Go deeper: Bidding in the first auction can be tracked here. The Wall Street Journal's D.Live wraps up in Laguna Beach, California. Cisco reports earnings after the markets close. StubHub named former Morgan Stanley banker Greg Mrva as its CFO. Flipkart CEO Binny Bansal is stepping down after an inquiry into misconduct. It wasn't really Ross from "Friends" that recently got arrested in London, but it sure looked like him.